GhoStory Guru is a feature on my regular website, http://www.kristipetersenschoonover.com, but you have a chance at winning a free copy of Skeletons in the Swimmin’ Hole–Tales from Haunted Disney World just for fun, so I figured I’d share this one over here on the Haunted Disney site (if you like this feature and want to receive it twice a month, you can sign up for my blog over at my other site. I also post news about my upcoming work and some other fun stuff). I’m a New England girl, born and bred, and so I have a deep love for writing New Englandghost stories—mostly because, let’s face it, the creepy woods, two-hundred-or-more-year-old houses rife with Colonial tragedy, silent winters and pretty-near-consistent gray weather eight to nine months out of the year are the perfect setting for such tales. It’s just too easy. I’ll start withFlorida’s feature: “What Say the Frogs Now, Jenny?” byHughB.Cave. There are a few hallmarks which make this a fabulous ghost story, and I can’t go into depth without completely spoiling it (the mark a true craftsman at work), so I’ll be a little vague. The most striking element is the fine motif Cavehas chosen to weave throughout the piece: that of hands. With so many subtle references popping up, it works on the subconscious to create the overall feel of hands reaching from beyond the grave. The second is the fact that we love Jenny—we feel sympathy toward her; she’s the hardworking, just-can’t-seem-to-get-ahead girl we all recognize in ourselves. And the third? A shocking twist on the combination of the first and second things I mentioned, and if I explain how it works in terms of literary mechanics, I will ruin everything. You’ll just have to read the story and find out. This book—only issued in hardcover, as near as I can tell—seems to be out of print, but there are several used copies at reasonable prices available through the Amazon Marketplace here: http://amzn.com/1435104579 But if you’re a ghost story lover, no price should be too high to own this one. 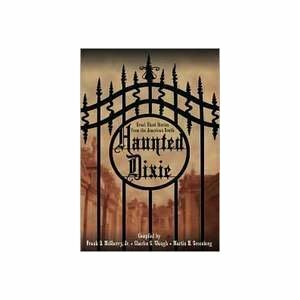 Frank D. McSherry, Jr., “Into the Shadowy South,” in Haunted Dixie: Great Ghost Stories from the American South, comp. by Frank D. McSherry, Jr., Charles G. Waugh and Martin H. Greenburg (New York: Fall River Press, 1994), vii.